Use some of your home grown fruit to make your own supply of fruit drinks, both soft and alcoholic. What are Fruit Syrups & Squashes? Syrups are strained fruit juices, sweetened with sugar, whilst squashes have part of the fruit tissue included. Citrus fruits are mainly made into squashes and other fruits into syrups. Both can be diluted with water or soda to make refreshing drinks. Syrups can also be diluted with milk to make milk shakes and used, in a concentrated form, as a sauce to serve with ice creams, sponge puddings and fruit. Children love syrups and juices and it is a useful way of making sure they get enough Vitamin C.
Fruit liqueurs are more extravagant as they have an alcoholic base but they are fun to make and are particularly palatable! Fruit should be ripe and fresh but in good condition – an excellent way to use fruit that is too ripe for bottling or jam making. Unripe fruit should not be used as it is too acid and the juice yield will be insufficient. Fruits that are rich in pectin are fermented to break down the pectin and prevent the syrup from forming a jelly. This will take up to 5 days. If fermentation is allowed to continue for too long the flavour of the syrup will be affected. Use hot sterilised bottles. Those with screw-tops should be filled to within 1 inch (2.5 cm) of the top and those with corks to within 1½ inches (3.75 cm). Corks must be new. Sterilise corks and screw tops by covering with boiling water and leaving to stand for 15 minutes before using. Syrups and squashes MUST be sterilised or they will ferment. This can be done in two ways. Stand the filled bottles in a deep pan as for Fruit Bottling. Either keep at 77°C/170°F for 30 minutes or at simmering point 88°C/190° for 20 minutes. The water should cover screw-tops or reach corks, which must be tied down with string, strong cloth or wire. Add 1 Campden Tablet dissolved in 1 tablespoon warm water to each 1 pint (570 ml) liquid. These tablets are usually available in shops selling wine-making equipment or chemists. They may cause the colour to fade a little but does not affect the flavour. After sterilising, tighten screw-tops and press in corks firmly. If using corks, leave to cool and dry, then dip the neck of the bottle into melted paraffin wax to make a completely air-tight seal. This should cover the cork and about ½ inch (1 cm) down the neck of the bottle. Paraffin wax is available from chemists. Melt the wax in a basin standing in a pan of hot water over a very low heat, do not let it get too hot or it may ignite. 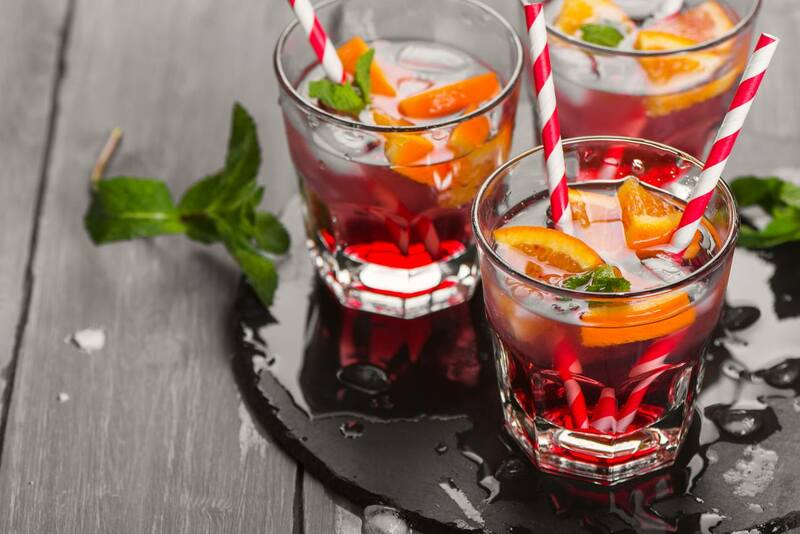 Fruit liqueurs are made by steeping the fruit, sometimes with other ingredients, in spirits until they flavour the liquid, with sugar added to sweeten. The best spirits to use are brandy, gin, vodka, whisky or white rum. If the flavour of the fruit improves with stewing, the fruit is cooked in wine rather than water and sugar added at that stage. Leave the bottle or jar in a warm place, preferably in a sunny window, stirring occasionally, until the desired flavour is achieved and the sugar has dissolved. Strain and pour into sterilised bottles and seal with sterilised corks.